As of this moment, a running time is installed above each article. The first line will show how many days to the Presidential election. The second line will be how many days until President-Elect Barack Obama has until his inauguration. After inauguration day, a daily record will be kept on known activities of President Obama, showing how many days of service as President have gone by from day to day for each year completed in office. 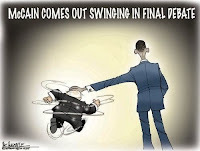 As everyone from both sides Democrats and Republicans seemed to think that nothing short of a miracle needs to happen during the final debate if John McCain was to stay into the race. With less than 3 weeks to go, McCain is trailing in the National race by 7 to 8 percentage points. Now it has been predicted that Senator Obama has gone over the top in the prediction of electoral votes by the media. McCain was unsuccessful in the third debate VIEW BELOW, even if he was on the attack for most of the evening. John Mc'Cains attempt to stop Barack Obama win the evening was fruitless, as Barack Obama kept his composure throug hout the debate. The highlight unfortunately for John McCain was the various mentions of 'Joe the Plumber'. See Barack's interview of 'Joe the Plumber' immediately below the debate video. Whenever McCain would attack and get visibly upset, Obama would just smile and display a small laugh. Regardless of how McCain had attacked, Barack had a response ready, and an answer that appeared to be credible. Topics from everything from taxes, economy and 'Joe the Plumber' were brought up. But it is too late. Unless a miracle takes place from now until the election, Barack Obama will become the 44th President of the United states. Fifteen months of battling and campaigning are now almost over, and the American people can finally rid themselves of election politics. In the meantime, I have elected to purchase another domain name, http://obamainthewhitehouse.us so that I can begin and maintain a daily accounting of Barack Obama. It should be the only place that you need to go to find out things about the Whitehouse and Barack Obama as President and information concerning about his very soon to be very public personal life as President. I have faith that Barack Obama will win, thus the reason for the early beginning of the new blog. After the election, all political articles concerning Barack Obama will be only supported on the new blog.